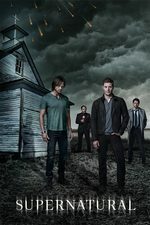 An old friend enlists the help of Dean and Jody Mills when a wraith kills her friend and comes after her granddaughter. Sam continues to work with Jack to control his powers. I yelled out loud at my TV when Missouri showed up, even though like half a second later I realized it was because they were going to kill her. I know this is not a realistic expectation of this kind of show, but it was really pushing needless drama for me that Dean found out Missouri died from the news (like not even local news! ), by name, before anyone had contacted her son, and that her son apparently hadn't tried to tell his daughter at any point during the entire day, and so Dean ended up telling both of them. Like I guess it's an estranged family. I guess. Just started the episode, I was excited to see Harper from The 100! Aaaand then she's dead. But I guess I should be glad that she'll continue on The 100! Yeah, the news report thing seemed like AWFULLY convenient timing! These days with Supernatural it seems like there's often one little WTF moment per episode. Last week it was the snarky angel quipping about her college roommate. This week, it was this. Apparently Patience will be a major character in the upcoming spinoff. Well... OK? She seemed nice and all, but she didn't strike me as a character we needed to learn more about. Maybe she's supposed to be the "normal" one to balance out more troubled characters like Claire and Alex. Castiel is apparently not dead again! It's always nice when he's not dead again. Last week it was the snarky angel quipping about her college roommate. I didn't find the convenient news report distracting, I mean it's par for the course for this show in terms of plotting and pacing. They just needed to get this episode that introduces Patience out of the way for the spinoff, and that's actually great they did it on episode 3 before major season arcs really get rolling. I did also really enjoyed her coming to terms with being psychic. It was much quicker than most characters on genre shows, but it made sense. No need for 3+ episodes of confused moping around and accidental psychicing before admitting it. Ok, but i loved Patience's friend from school. Can we have more of her, please? As part the Scooby gang, please?